I have an idea… | Finding delight. When you see one of those flashing speed limit signs that tells you how fast you’re driving, even if you’re only going a notch over the ridiculously low speed limit, you slow down, right? You take your foot off the pedal. Start to coast for a few seconds until you’re a safe distance away. In fact, these signs are ridiculously effective. Studies repeatedly show that when alerted by a radar sign, speeders WILL slow down up to 80% of the time. Typical average speed reductions are 10-20%, and overall compliance with the posted speed limit will increase by 30-60%. 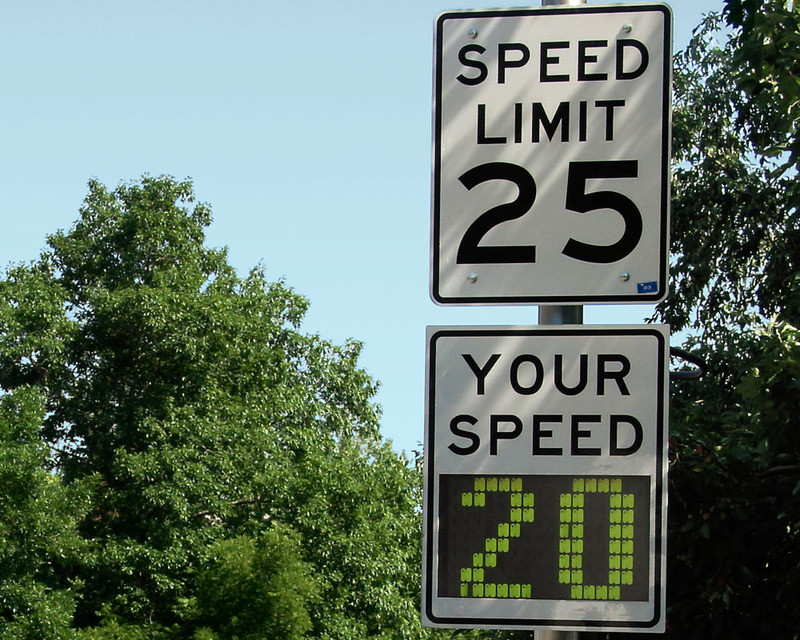 Which got me thinking…could we harness the power of the radar speed sign for other applications? And then, *lightbulb* You see, try as I might to be mindful of my posture as I work at my desk. I fail. A lot. But what if I got a reminder to straighten my spine and not sit like a Notre Dame resident as I power through a project? What if I saw a photo flash across my screen of someone displaying bad posture? And what if these photos kept coming in the form of intermittent pop-ups any time my desktop was on? Would my back grow taller? Shoulders loop? If the efficacy of those speed limit signs are any indication…my money’s on YES. Do you have any tips or tricks for better posture during computer work? I’m all ears. And if you take this idea and make a million dollars off of it, you’re welcome! Gosh yes I need this too. My husband sets reminders that pop up on his desktop to tell him and get up and stretch/walk around at work a bit so he doesn’t sit there all day. That’s the best thing I could think of regarding this. Maybe. There’s a bit of the rebellious teen in me that deliberately slouches, out of some feeling that good posture is just one more damn thing being demanded of me… Ridiculous! Oh yes, how i would love to have this app in front of me. Always sitting wrong when i stay many hours in my office! Cool idea! I like it. I used to have my computer set to give me a random positive message every time it started. Alas they took that away. It is more difficult now… everything is set to sell me something. As a full-time writer (constant typing), I need this too! Sometimes I only realize I am sitting in the wrong position after long hours enough to have broken my spine, haha this would be lovely really! ERMAGERD, I was just saying to myself that I need to work on my posture. I would TOTALLY go for this reminder. I don’t wanna be all slouched over all the time. My posture is so bad at work. I always make sure I get up and walk around once in a while. I so need this! No tips here, as I’ve got the worst posture in the world.